Specifically formulated for application over steel joining plates in concrete tilt-up panel construction. Panel Patch has a 4-hour fire rating when used as per the Unitex specifications, and is suitable in fire rated walls. Download the Unitex Panel Patch Brochure here. 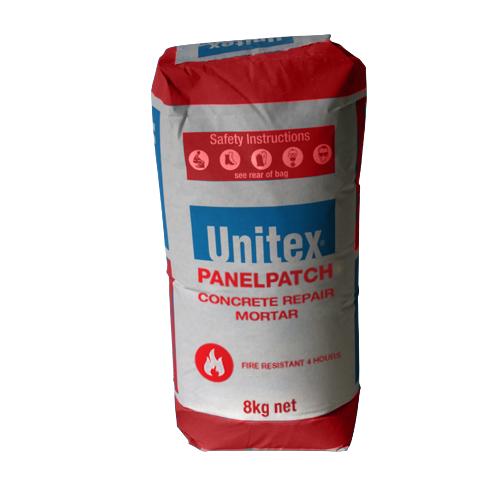 Unitex Uni-Dry Cote® Panel Patch is a fine to medium modified cement-based powder specifically formulated for the repair of surface damaged concrete. The carefully selected ingredients in Unitex Uni-Dry Cote® Panel Patch provide a mortar with very strong adhesion to concrete and masonry substrates. You only have to add water – no other ingredients are required. Unitex Uni-Dry Cote® Panel Patch provides a smooth and solid finish and has a four-hour fire rating*. Unitex Uni-Dry Cote® Panel Patch is trowel-applied and suitable for a one-coat application over joining-plate recesses of precast panels (applied 30mm thick) or damaged concrete. Unitex Uni-Dry Cote® Panel Patch is a modified cement-based High Performance Water Resistant and adhesion promoting render system. 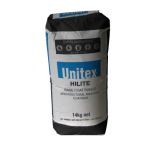 Unitex Uni-Dry Cote® Panel Patch is supplied in ready-to-use 8kg (20ltr sack) bags and is available in either grey (standard) or off white. When mixed, Unitex Uni-Dry Cote® Panel Patch makes enough compound to cover ten joining plate recesses (200mm x 200mm x an approximate thickness of 30mm). Before application of any render the surface of the substrate must be clean, dry and free of any debris. This means that any loose or damaged substrate must be removed, or patched and made good, prior to application of the patch. The dry substrate surface must be cleaned free of any grease, oils, scaling laitance, efflorescence, form-oil compounds, mould, fungi, rust, dirt, dust or any other foreign matter. Unitex Uni-Dry Cote® Panel Patch products are dry powder-based products. This means that you are getting a 100% active product. All that is required is for clean water to be mixed in, on site, immediately prior to application to the substrate. After 28 days, compressive strength is 20mpa.